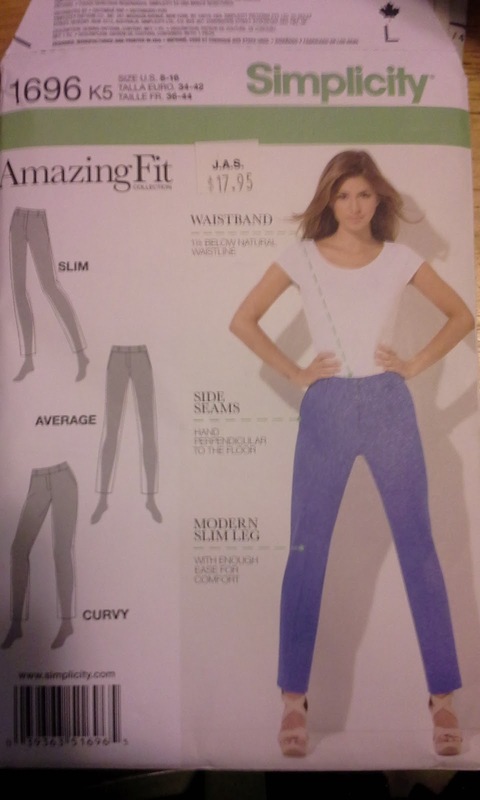 I started the Amazing Fit pants as assigned by Miss Bossy Patterns. (Did you hear that in the US, we are supposed to stop using the word "bossy?") I am using a navy linen. While I only have it cut out, I can give some information that makes this pattern different. I actually have marked, interfaced the four waist band pieces and fly, and over-locked the edges of the seams on the front and back pieces. I also stay stitched under the zipper and the front edge at the waist. Unfortunately, I didn't read the instructions well and made one small mistake. I was going to make a muslin, but the fitting instructions led me to believe that it isn't necessary, then I re-read them again and found that it is suggested. Well, I have extra fabric, so I'm not going to make a muslin. The first is that there are three versions of the front and back: slim, average and curvy. I was disappointed to be average in this. I have no idea why, but average seems like a waste of a "special" pattern. The second that I noticed was that some of the seams are one inch, but not all. I noticed this after stay stitching the front under the zipper. I was a very tiny smidgen over 5/8 inch with the stay stitch, thinking that I didn't want to go the full 1 inch. Luckily, I can leave the stitching (I already clipped to the stitching). The seam will still be less than 3/4 inch, so I'm not losing much. Finally, the fitting adjustments seem to be after the majority of the construction is done. I have vowed to follow the directions in this project because there are some requests for details. I am going a little slower this week because I am dealing with a rheumatoid flare. It is affected my hands, wrists, feet and ankles. And my energy. Hopefully, I will get make in the swing of things and get some work done after a day or two more of rest. I am glad you got started, and I hope the arthritis flare-up passes soon. This pattern is on my list too, and I just know I will end up "curvy." Sorry you are "average" (LOL). I hope the fit is AMAZING!! Vanessa, it is the crotch curve measurement that is used. The differences aren't very much, something like 1/4-1/2 differences. With 1-inch side seams, I don't think it is as big a difference. Hi Annette! Best of luck with the pants. I made an Amazing Fit blazer last summer and had a similar experience with the instructions. Seems like the major fitting seams are 1 inch (side seams, princess seams, etc. ), and the rest are 5/8 inch. I followed the fitting instructions for my muslin, got the fit to where I wanted it, and then cut my fabric for the real version. Thank you. I'm glad to hear your experience. I wish they did more of the fitting early on. I guess it would have been if I'd done a muslin. Looking forward to seeing your finished pants! I hope you feel better soon. Thank you. I'm starting to feel better. I just need to remember to pace myself. I am really not good at that.